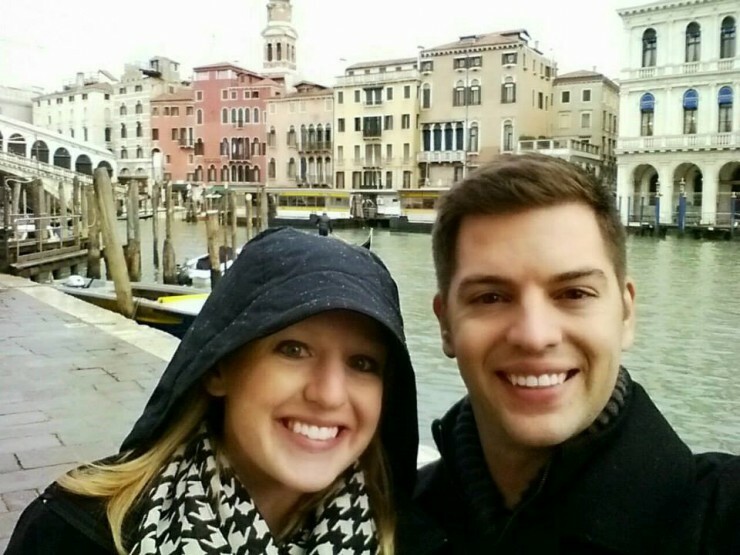 As I mentioned in Part III of our adventure in Europe, we left Austria after a short visit and we traveled to Italy, the country I was most excited to visit. 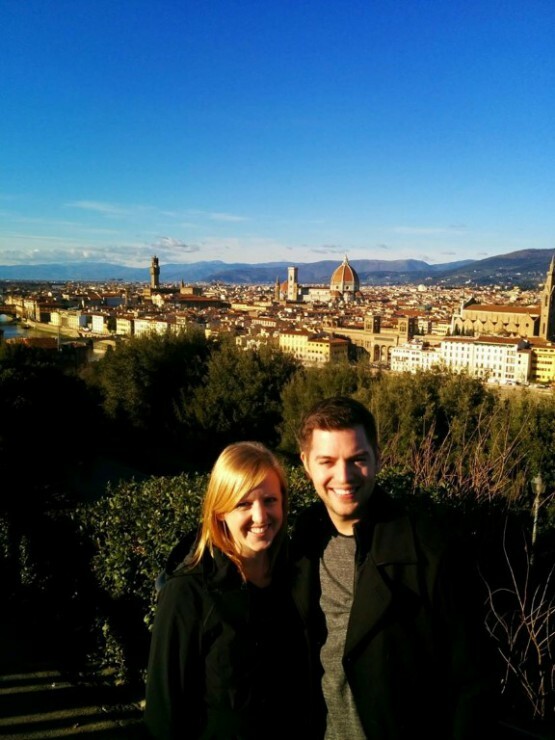 It was also the first country we stayed in for more than one night; our itinerary consisted of one night in Venice, two nights in Rome, and one night in Florence. Since I have so much to share about each place, I’m going to focus on Venice and Florence now and talk about Rome in my next post. 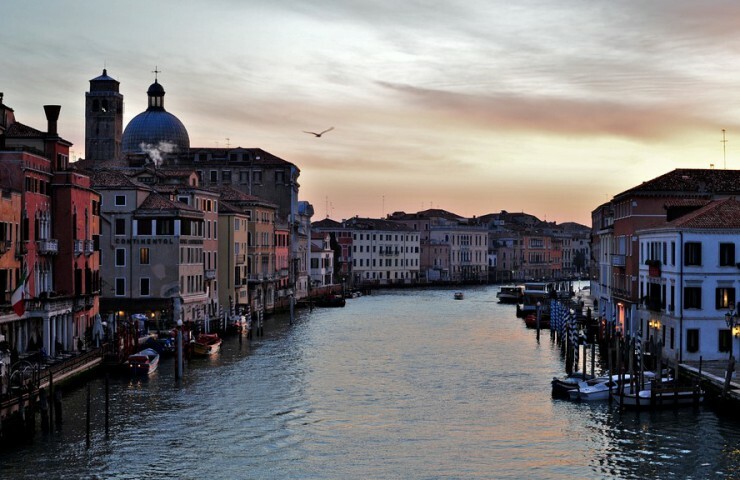 We left Austria bright and early and traveled along the motorway for about four hours to Venice. 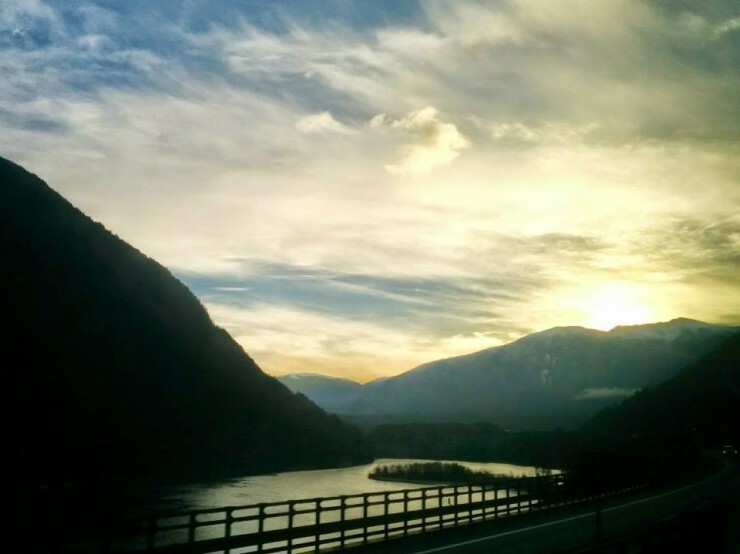 We traveled along the Brenner Pass into Italy and across the Dolomite Mountains. I definitely appreciated traveling through Europe by bus because it allowed us to see so much more of each country! Our first stop was just near the Italy/Austria border. 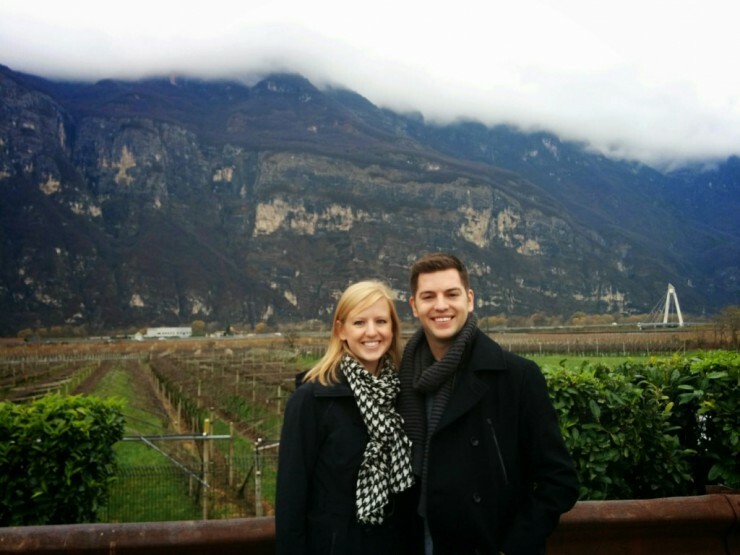 Evan and I loved seeing the our first glimpses of vineyards, and of course the mountains were beautiful too! We took this picture just outside of the first stop of the day. Before we went into the roadside cafe (think self-serve restaurant meets grocery store meets coffee bar), our travel director informed us of the rules for ordering and paying for espresso. Unlike coffee shops in the States where you order and pay at one end of the counter then pick up your drink at the other end, these espresso bars were set up differently. When you enter the cafe, you stop at a gas station-like cashier area, where you order and pay for your espresso and receive a ticket. Then you walk over to the espresso bar, hand the ticket to the barista, and wait for your espresso. Also unlike most coffee shops where there is ample seating and a quiet, relaxed environment, these cafes were small, only had a few high-topped tables to stand around, and were packed with people. 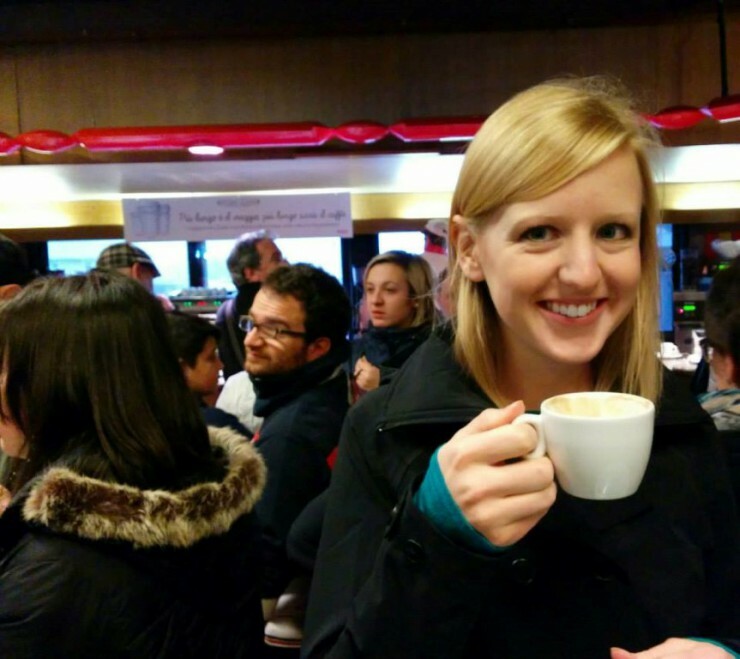 The picture below captures the crazy environment of our first espresso bar experience. Hopefully you can see the espresso machines in the back of the picture amidst all of the people. Although the experience was unlike any other coffee shop I’ve been in, the espresso itself was incredible and I left wishing that gas stations in the States offered such high quality coffee drinks! Oh, I should also mention that the coffee here was very cheap compared to your typical Starbucks prices. A cappuccino or latte cost about $2. I wish I could go back right now just for the coffee! 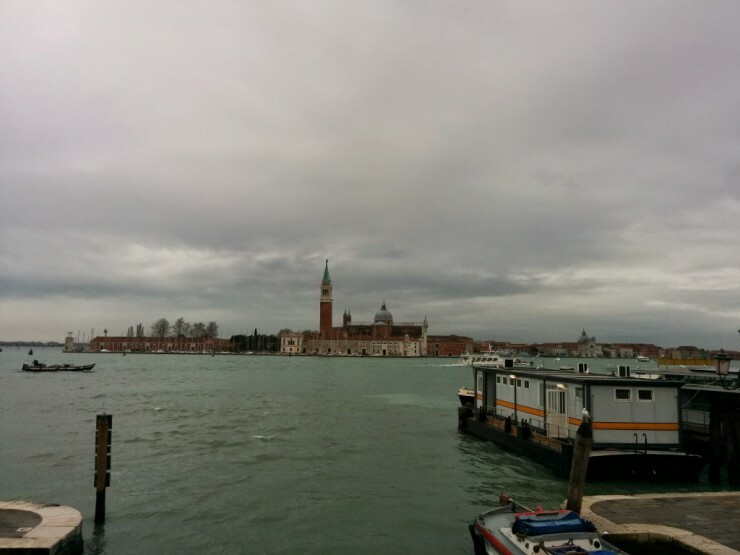 After our brief stop along the motorway, we continued our journey to Venice. The bus dropped us off as soon as we reached the island in the parking area since it was too large to take us into the heart of the city. 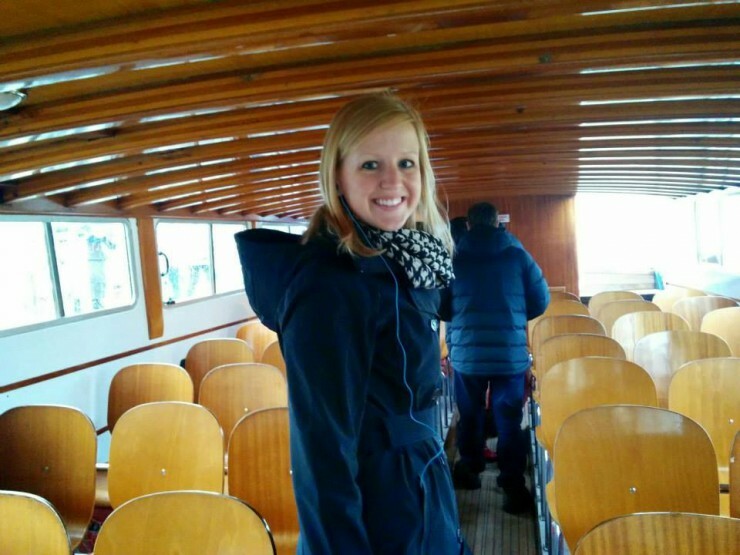 We boarded a small boat and traveled to the city center. Our boat ride lasted about 30 minutes and we were able to get some great views of the city, despite the gloomy, overcast skies! We went on a brief walking tour of the city with our group and travel director before having some free time to wander around. 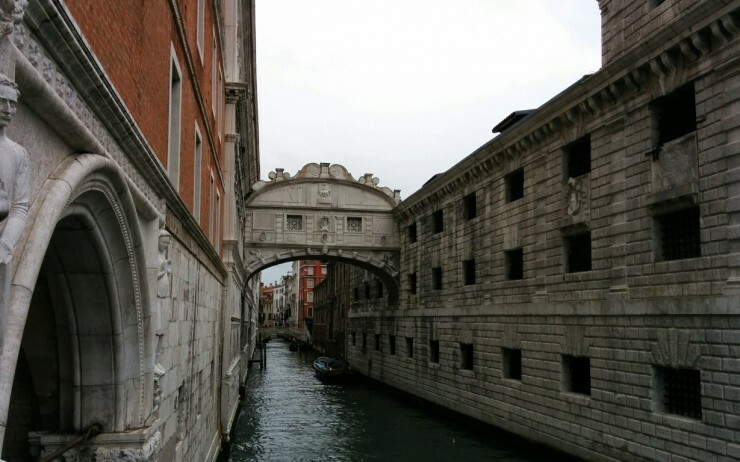 Our travel director pointed out the Bridge of Sighs and explained how it used to serve as a walkway for prisoners between the courthouse and prison. 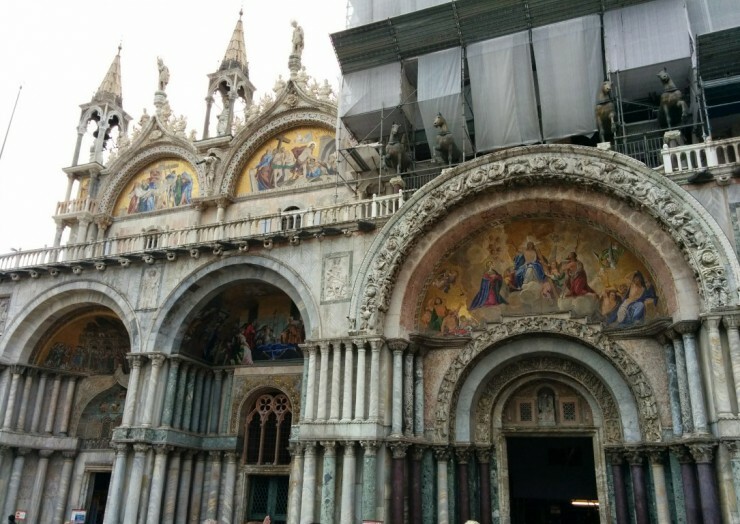 We also walked into St. Mark’s Square and saw the Basilica di San Marco (St. Mark’s Basilica). As you can see, the Basilica was undergoing some renovation on the exterior so we didn’t get a great view of the entire building. Members of our group went inside to explore, but Evan and I opted out and ventured out into the city. 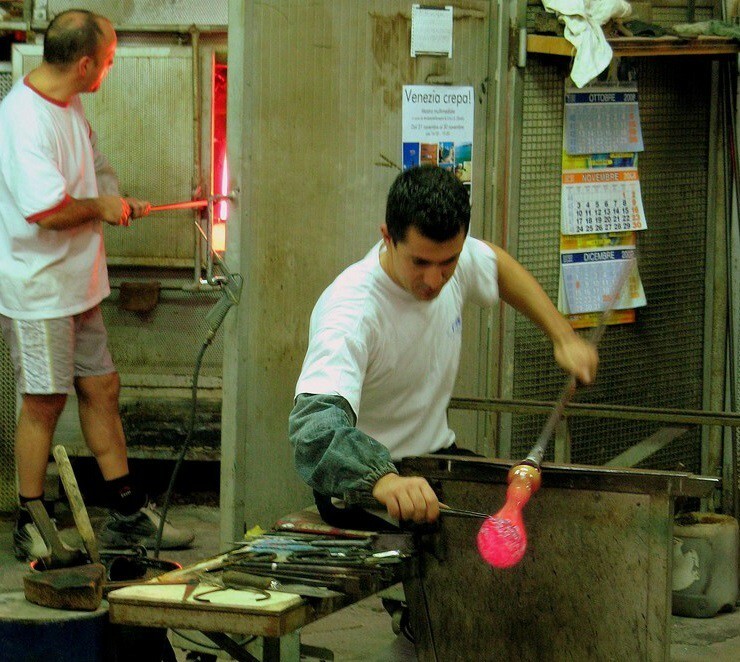 We visited a glass blowing factory and saw a brief glass blowing demonstration. It was incredible; those guys are extremely talented! 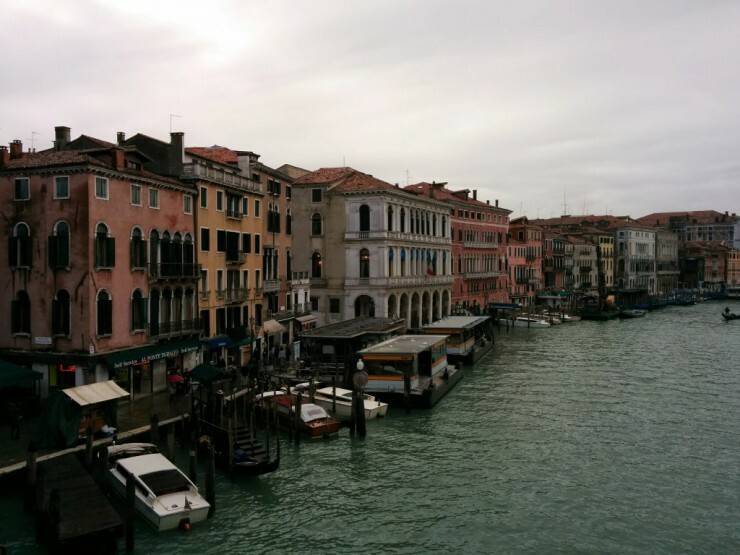 We then wandered through the streets of Venice, just taking in the unique atmosphere. 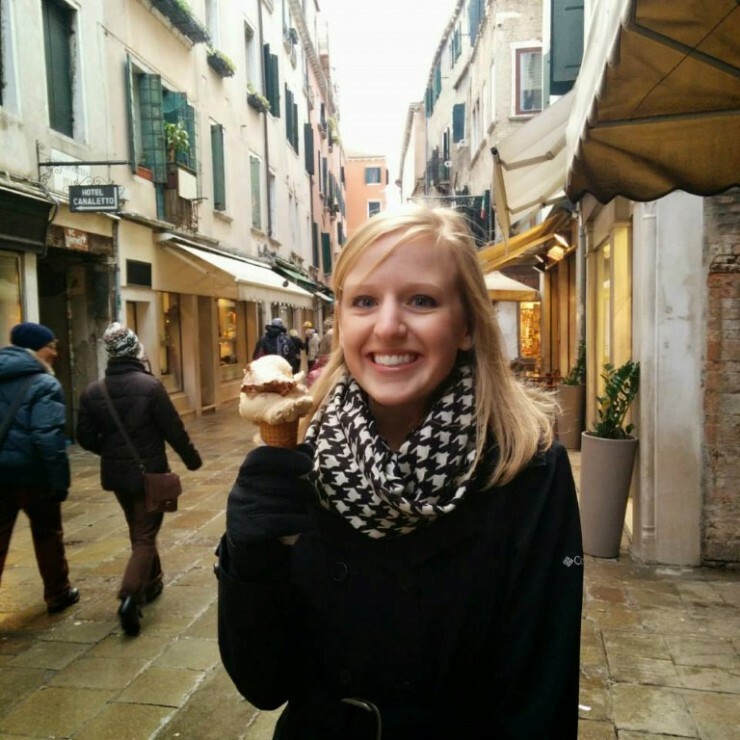 I vowed to eat gelato every single day we were in Italy, so naturally, it was one of our first stops. 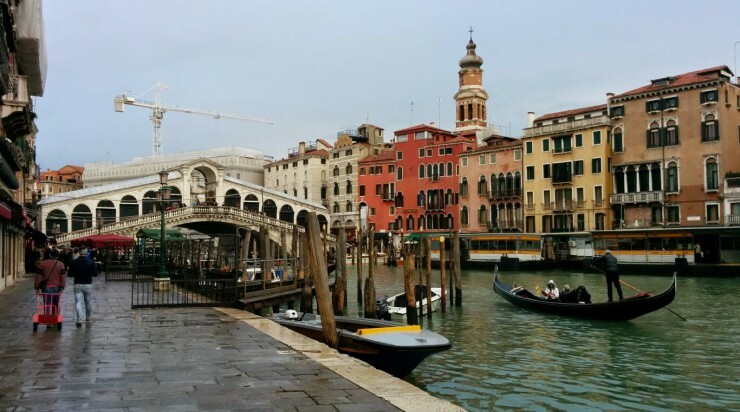 We enjoyed our gelato while walking over the Rialto Bridge and along the Grand Canal. 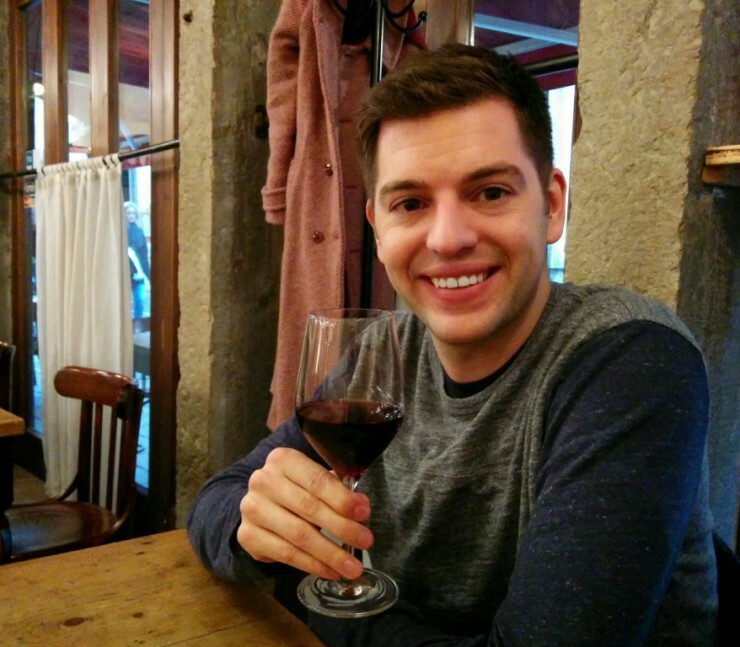 We started walking back to St. Mark’s Square and stopped in a small restaurant for a glass of wine. It must not be very common to only order a drink at a restaurant here because the waitress didn’t really understand us. Regardless, we both enjoyed a glass of red, Italian wine (unfortunately, I don’t remember the exact kind). 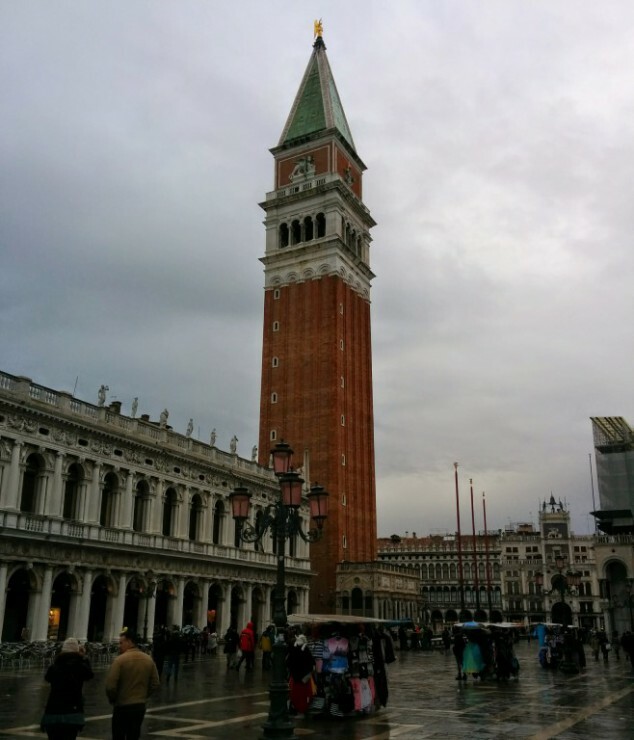 We met our group back in St. Mark’s Square before embarking on our gondola tour through the canals. 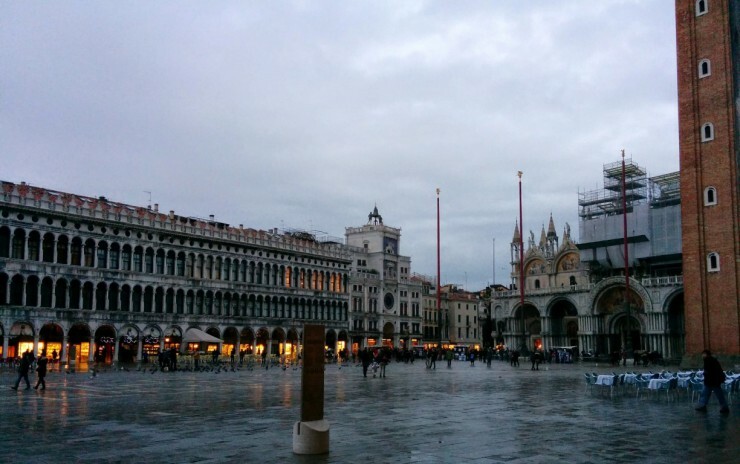 I wanted to include a picture of St. Mark’s Square at night because it looked so pretty all light up. 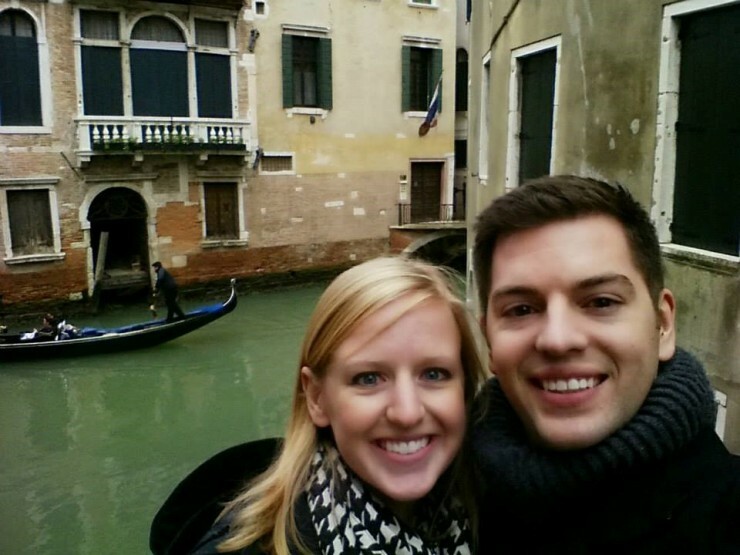 The gondola ride was an Optional Trafalgar Experience, but we were not opting out of this one. I’m so glad we participated because it ended up being my favorite part of our Venice visit. If you’re curious about optional experiences, check out Trafalgar’s European Whirl itinerary and scroll down to the bottom of the page. These excursions were optional because they were not included in our itinerary and trip cost. We originally planned to participate in two or three of these events, but ended up going to all but two. Sure, it cost more than what we planned on, but in my opinion, the experiences were worth the money! Evan and I got lucky and rode in a gondola with only two other members of our group; we also had two amazing Venetian musicians with us. 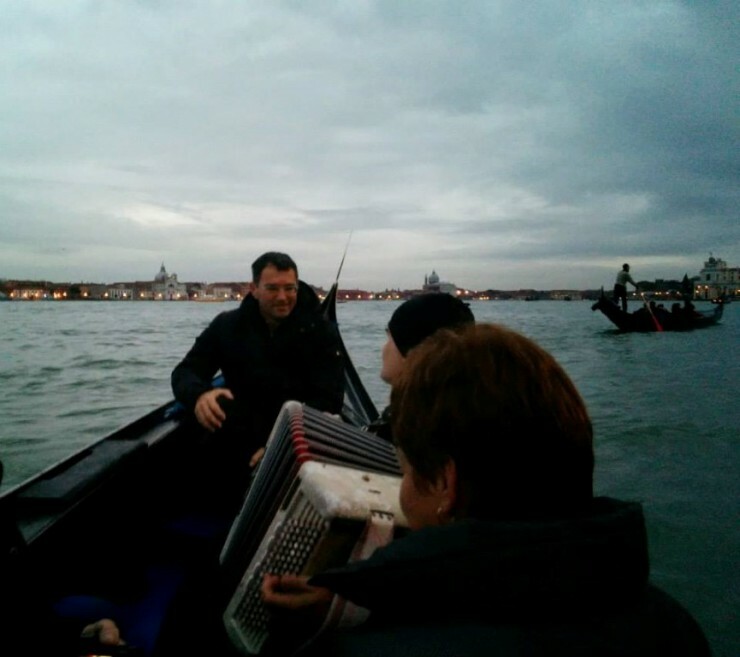 We rode through the canals at dusk, serenaded by these two men shown below. I even captured a brief video of their music! 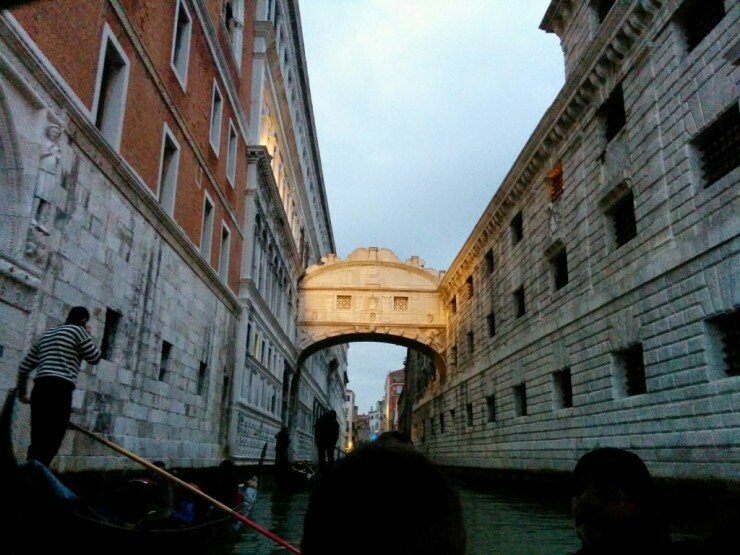 Here is the Bridge of Sighs once more, this time with the fading sun shining upon it, as seen from the gondola. 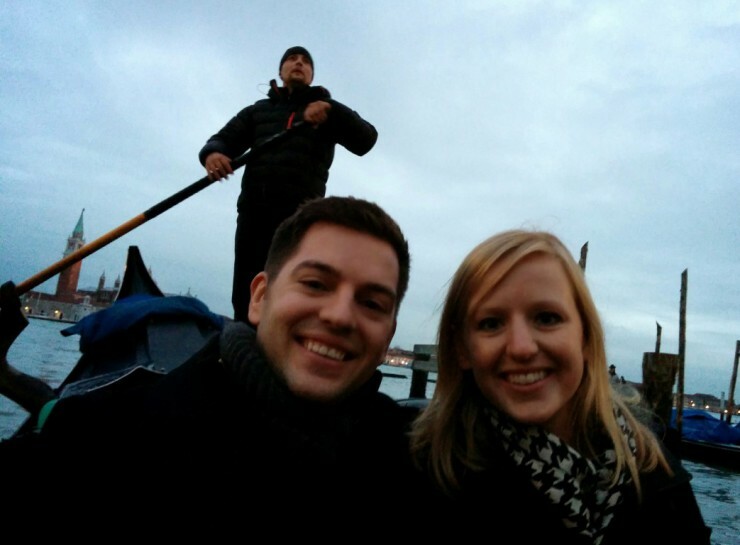 Here is the gondola operator behind us; I’m still not sure how these guys maneuver the gondolas through the canals. It was such a smooth ride, and definitely something I was always remember! After our hour-long gondola tour, our group met once again in St. Mark’s Square and then walked over to the water taxi launch. We had another 30 minute boat ride back to the parking area where our bus was located. We all boarded the bus and drove to the Novotel Hotel, where we enjoyed a buffet style dinner with our group. Once again, we were incredibly tired after our long day of exploring, so we called it a night early in preparation for our journey to Rome the following day. We traveled from Venice to Rome and spent the next two nights in Rome before continuing our Italian adventure in Florence. Since I have so much to share about our time spent in Rome, I’m going to jump ahead to Florence right now and talk about Rome in my next post. Our drive from Rome to Florence was about 3 hours, a relatively short trip compared to some of our other travel days. 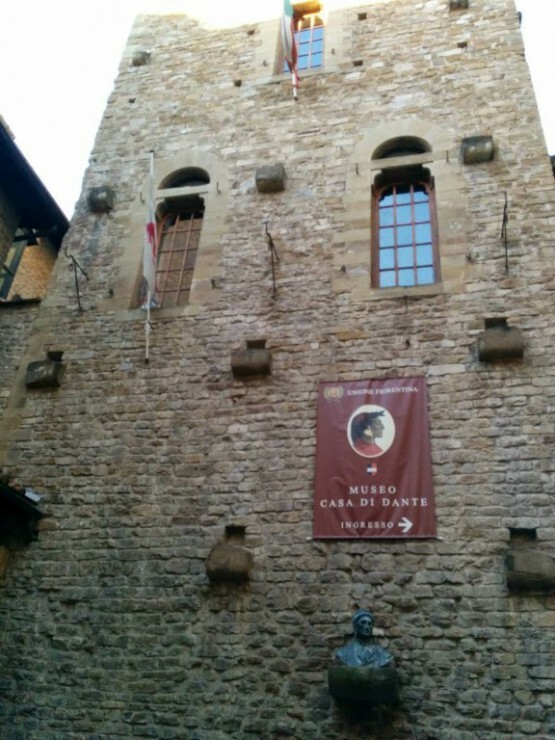 As we drove into Tuscany, our travel director educated us on the Renaissance and shared interesting facts about Michelangelo, who was born in Caprese but spent much of his school years in Florence. 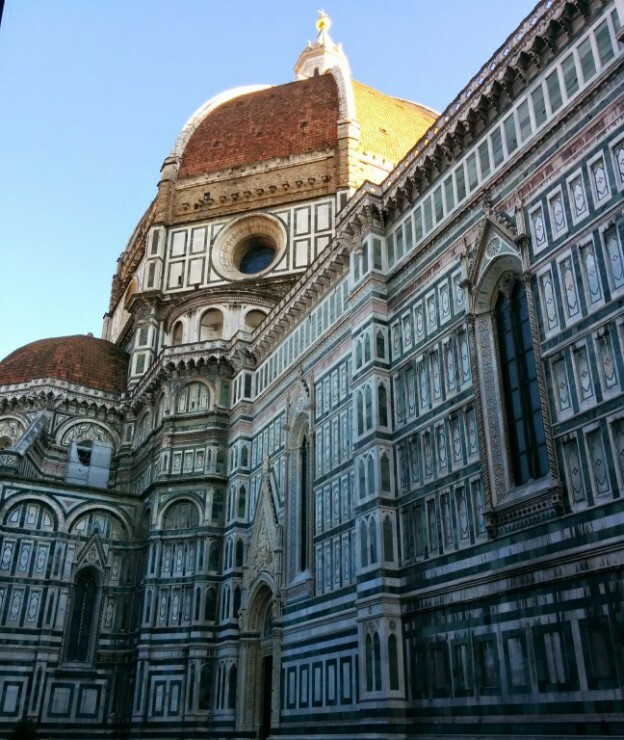 His work on St. Peter’s Basilica in Rome was inspired by the Santa Maria del Fiore Cathedral in Florence. 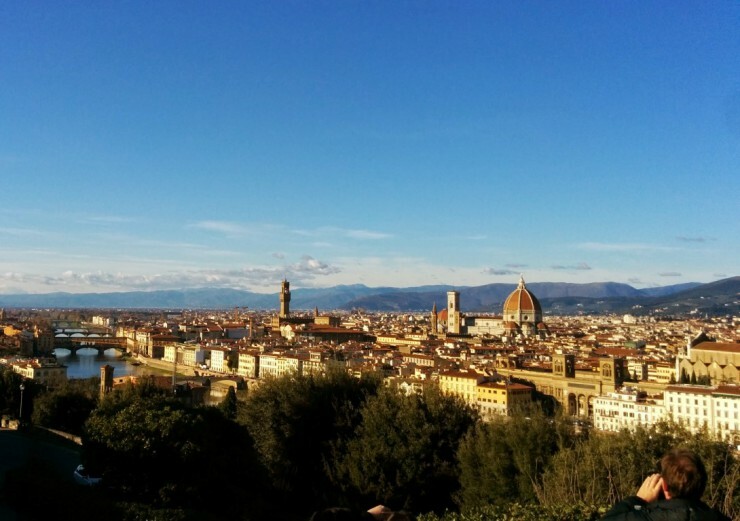 Our first stop in Florence was at a lookout point above the city that offered great views and a great first impression of the city. Plus the warmer weather and sunshine didn’t hurt either. 🙂 This lookout spot also hosted a replica of Michelangelo’s David. The original is located in a museum in Florence; unfortunately the museum was closed when we were in town and we were unable to see it. Our travel director served as everyone’s photographer at the lookout point. Thanks Emile for the Christmas card photo! After a brief visit at the lookout point, we made our way into the town and met a local guide for a walking tour of Florence. We saw the Cathedral up close and were amazed by the marble dome. 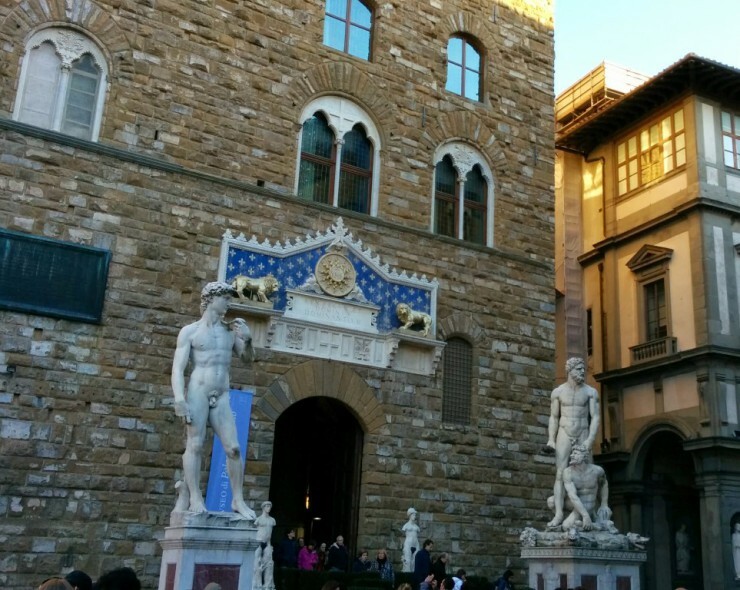 As we walked into the Piazza della Signoria, our local guide enlightened us with a brief history lesson on Florence and the beginning of the Renaissance. It was so nice being able to learn about the city while touring it. We also saw another replica of Michelangelo’s David. After our walking tour, I continued my daily gelato feast when our entire group stopped for a treat at Vivoli. 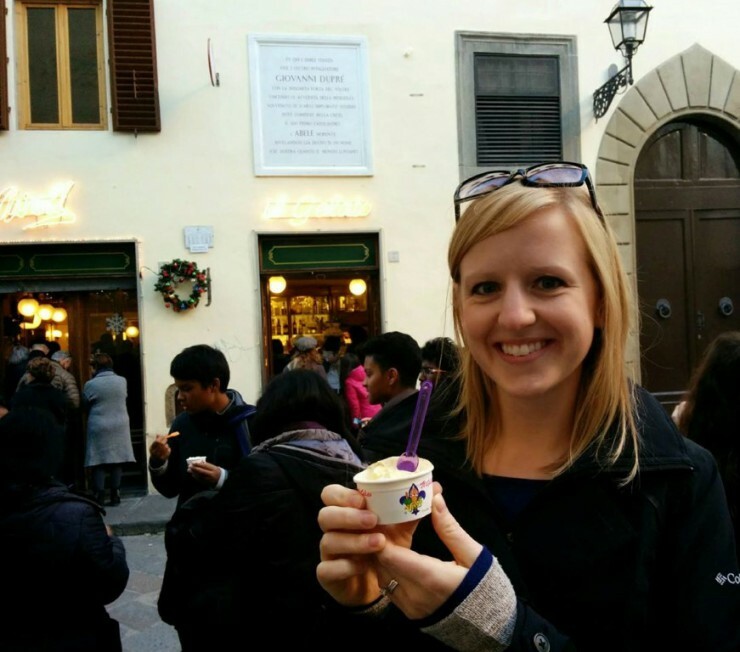 See below for an obligatory picture of me and my gelato, which was probably some of the best I had on our trip. 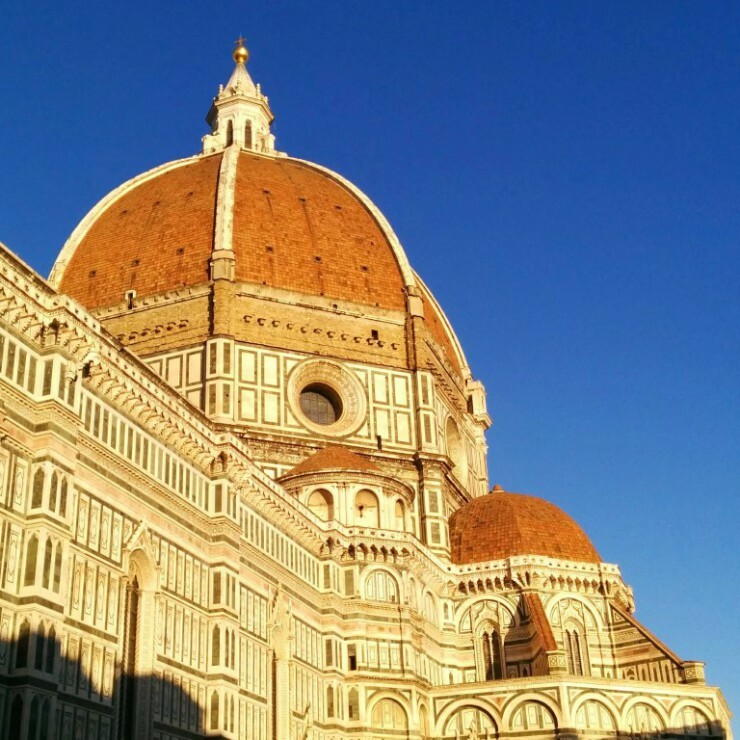 We had some free time to explore Florence, so Evan and I did some window shopping in a leather store, then walked through more Christmas markets in Piazza Santa Croce. It was a little hectic and we weren’t interested in buying anything, so we found a small cafe and enjoyed a delicious cappuccino. 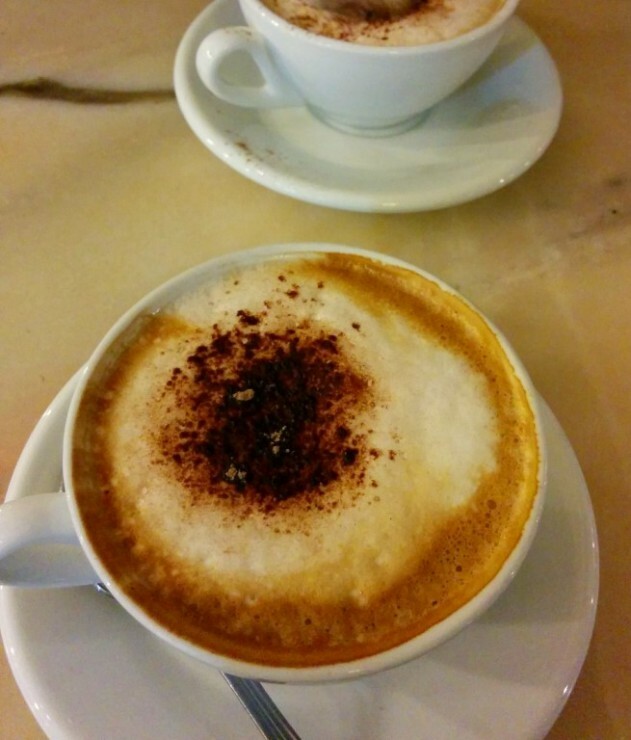 We learned that a lot of cafes here serve cappuccino with a dusting of cocoa powder. I think they might be onto something! We met our group for dinner at a local restaurant and enjoyed several courses of pasta and of course, wine. I’m pretty sure I waddled back to the bus after eating way too much. We stayed at the Cosmopolitan that evening and were up bright and early the next morning for breakfast before continuing on to Switzerland. Check back soon to see more about our European adventure in Rome and then Switzerland! And if you’re interested in reading more about our European trip, check out my posts on London, Belgium & the Netherlands, and Germany & Austria!